Rate this Article We have VR headsets that require either a powerful PC or a powerful phone to run, but with the IdeaLens K2 headset, you'll need neither! The popularity of Virtual Reality continues to spawn innovative ideas in the development of headset units and peripherals. Wherever VR applications will run, a headset or equivalent device will be created to cater to it. The PC, the Game Console and the Mobile Devices have a variety of VR headsets built specially for them. From the big, heavy and bulky to the lightweight, compact and comfortably ergonomic, VR and AR headsets are popping up like mushrooms here and there. Being a veteran of the computer age, the VR wars today sort of mirrors the micro-computer revolution of the late 70’s and 80’s where so many brands came out competing for one specific application. Enter Idealens - another unique brand with an equally innovative headgear for the VR world. This particular headset does away with whatever device you’re supposed to connect the headset to. No PC, no Console and no Smart Phone. The headset itself is virtually all-in-one! First off, it’s light. Compared to the Oculus Rift (which has become the standard headset for comparison) the Idealens is only about 295 grams. The Oculus weighs around 470 grams, almost twice as heavy. It also employs effectively the principle of counterweights. It uses an ergonomically and comfortably designed head-mount with the battery pack located at the back of the users head to serve as a counterbalance which holds the headset firmly and comfortably in place. Idealens is mobile and compact. Being an all-in-one solution, it houses the display, processing hardware and battery in a single sturdy package with no need for any external connections whatsoever. Everything you need to run VR is already there, built into the headset itself. From a practical point of view, the headset itself is a compact mobile device. It is powered by a Samsung Exynos 7420 processor which is the same one used for Samsung’s Galaxy S6 smart phone. It uses a Mali-T760 GPU (video chip), 3GB of RAM, 32GB of expandable internal storage and a 3800 mAh battery pack. Optically, it has a 120 degree FOV (field of view) for its two 3.81” AMOLED displays with a pixel density of 770ppi and a refresh rate of 90 Hz. It also uses Asynchronous Time Warp Technology that effectively reduces the dizziness during use because of display delay which can be controlled to within 17ms. Added to an internal IMU sensor with gesture support, motion tracking, and Wi-Fi connectivity, the headset lets you experience a virtual world with greater smoothness and immersive mobility. Using AMOLED (Active Matrix Organic Light Emitting Diode) adds a layer of semiconductor film behind the regular OLED displays used by Sony VR and other similar headsets. This increases the response time of the pixels and together with ATW makes it quicker and smoother to display and change images reducing the delay which adds to other factors that causes nausea from viewing Virtual Reality. The headset is robust and can accommodate people who wear glasses. Also, there is a track pad at the right side that provides an easy way to control the applications being run. The unit uses Android as its operating system. The company plans to come up with later versions of the headset that will use 4G LTE technology and the even more powerful Exynos 8890 processor used for the new Galaxy S7 smart phone. Idealens has announced that the headset will be marketed with a wide range of content and compatible software, which will include over 100 games and more than 1 million hours of video. Launched on May 6, 2016 at Seattle, the presentation was conducted by Brent Jentzsch, Business Development Director of Idealens. Several experts in the field of VR as well as company executives and software engineers where present to get first glimpse and test the product. During the event, Idealens K2 was able to demonstrate its advantage as a mobile all-in-one VR device which gave the user freedom of movement while being immersed in the virtual world. Test participants reported of the great image quality and expanded field of view which had such immersive quality that they had a little trouble returning to their senses after the headset was removed. No definite release date and unit price has been announced yet as the market waits in anticipation for the release of this innovative piece of mobile VR equipment. 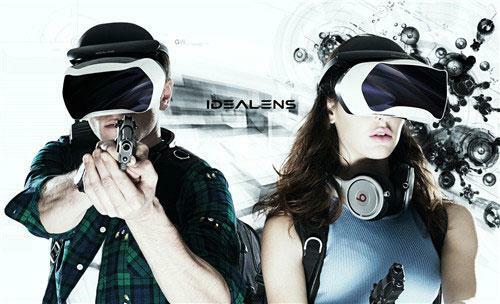 At this point and given the amount of competition with many VR and AR products being introduced and released every now and then, it would still be difficult if not impossible to tell how Idealens will perform in today’s market. The all-in-one concept however will prove to be of great potential as devices grow smaller and compact without losing its features and capabilities giving users the mobility to normally use them in everyday life. Innovations like Idealens will continue to bring us closer to having VR/AR devices worn on ourselves just like wearing regular glasses today.